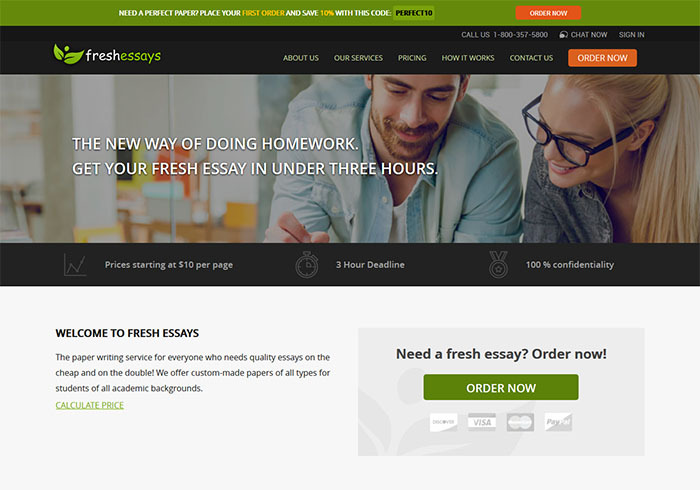 Freshessays.com is website of a writing agency, that claims to be specialized on providing academic papers of any types and level of complexity for students. Apart from writing, the team of writers hired by Fresh Essays company provides other services, including editing of the completed work and creating Power Point presentations. Is Freshessays com legit? There is nothing about the company being legal, the only thing promised in case you are worried about any consequences is that all the personal information is private and is not shared with any third parties. This is a Fresh Essays review. The range of services provided is broad, therefore, freshessays.com offers you to choose among a number of paper types while filling in the order form. All the services are divided into 4 groups on the website: Writing from scratch, Editing/Proofreading, Admission Essays and Power Point presentations. The prices for all the papers are calculated as 275 words per one page, the academic levels available are Undergraduate, Bachelor and Professional. The writers do not complete any online tests, but can solve problems and complete multiple-choice questions. Editing/Proofreading stands for the type of service, that lets the writer change up to 30% of the text you provide, fix the errors and change the word order so the text is easier to comprehend. Fixing plagiarism is not an option, as the writers cannot add new information to your paper and rewrite it completely. Admission letters section also includes completing cover letters and personal statements. The deadlines for all the orders range between 14 days and 3 hours. The agency claims that the service of the highest quality is provided. Freshessays.com reviews, however, do not advise you trying the website for the highest academic levels papers, as the writers might not be professional enough to complete them in a good way. The prices for writing from scratch start with $10 for the longest deadline, which is 14 days, and Undergraduate academic level and rise up to $48 per page of the order placed for Professional level with 3 hours deadline. Admission help is charged differently and depends on the deadline, prices ranging from $38 to $113 per page. Reviews on fresh essays state, that the prices for rewriting, editing and higher academic level do not correspond with the quality of the work provided. Power Point presentation costs half the price of writing from scratch service, but in case you want notes to be included, you will need to pay for them in addition as for writing from scratch type of service. Preferred writer, TOP writer and Advanced regular writer. All of these writer’s ranks are higher than Regular writer’s ones. Unless you choose any of these options, Regular writer will be assigned to complete your order. VIP custom service. This service will guarantee, that the support team will proceed with your inquiries and messages before the other’s. Sources used. If you have selected this feature, the copies of the sources the writer has used will be sent to you. All the additional features are non-refundable. You can have a freshessays.com discount code 10% off for your first order, (Fresh Essays discount code is perfect10) and after this you can have a 5% discount once having above $500 spent on the services, and 10% once you have spent over $1000. You can choose any of the following ways to approach the support team: you can skype-call them, contact them via the phone, ask them to call you back, send an e-mail or join the chat online.